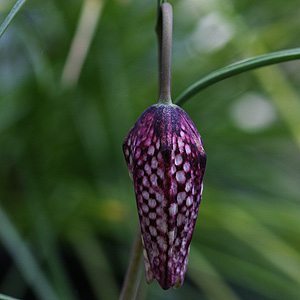 Fritillaria meleagris bulbs grow well in any free draining soil, well suited to a rock garden, growing in pots or in a woodland situation. Part sun to afternoon summer shade is best. Plants will reach 30cm with the flowers held high, foliage is sparse. Plant in Autumn for a great display in late winter to early spring. We grow ours in containers as well as in clumps in the garden border. Look for the white flowering F.meleagris alba as well as few cultivars. Originally native to areas of Europe from France through to Russia F.meleagris is now rare in the wild but common in cultivation. Grow from bulbs or seeds if you are patient. Clumps can be divided in autumn to winter in Australia. Fertilize with a liquid seaweed or slow release fertilizer. 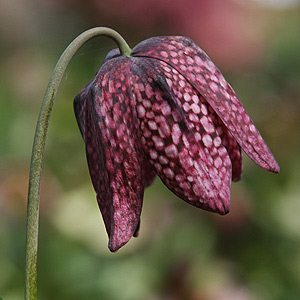 Once established Fritillaria meleagis is relatively low care. They grow well in full sun to part shade and will grow well in containers for 3 – 4 years before needing repotting. Plant the bulbs 5 cm (2 inches) deep. Use a humus rich well drained soil. In late winter to early spring its time to fertilise with some organic fertiliser, a little aged cow manure and a little light mulch. 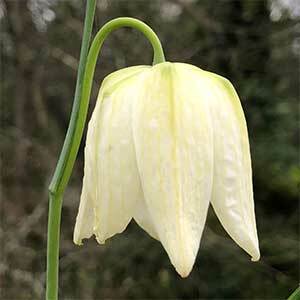 In spring, its time to water Fritillaria if the rainfall is poor, this ensures better flowers. Over summer, try not to let the soil or bulbs dry complexity. After flowering, leave the foliage until it does back naturally, this will give nourishment to the bulbs for next season. Once the foliage dies off, you can remove it to tidy up the area. Flower heads can be left to promote self seeding, or removed to prevent it. After the foliage has died right back its time to apply a light mulch. Colors from white to the deep purple chequered. Grows well in containers or in the ground.